I want to share with you a helpful online paint tool that I use quite often: Easy RGB. 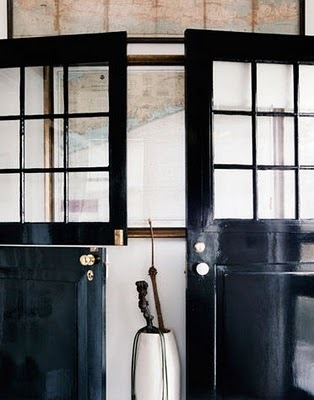 Let's say you go over to a friend's house and her living room is painted the OLD Porter's Indian Ivory. You come home and realize you only have a Sherwin Williams paint deck...Crap. How can you figure out a close match to Indian Ivory without having to go through Porter??? From the toolbar at the top click on "From Commercial Tints to RGB"
Last step- just select the paint brand you'd like to match your color to. Press Start. Voila! Sherwin's closest matches to Porter's Indian Ivory. Go back and select another brand to match it to and see how close you can get. Over Christmas I was able to relax at my parent's house in Birmingham. Sitting in their peaceful library with a dog at my feet and a cup of coffee is one of my favorite things to do. So while I was there my mom bribed me into I got the *delightful opportunity to rearrange her library bookcases!! A lot of people struggle to find books, pictures, etc. to fill their bookcases with. My parents have quite the opposite problem: They have TOO many books in their bookcases.. and other random clutter. As my mom likes to say "Toooo MUCH'A STUFF!" * Shed some light on your books! If you are having trouble with lighting and don't want to pay to add recessed cans or sconces consider putting a small lamp for additional light. In this case I added one of my mom's favorite little lamps to temporarily fix the darkness. * Take that 15% and find some of your favorite pottery and/or sentimental pieces. But narrow it down! *Stack books in both directions. *Layer photographs or pictures. Don't just stack them in front of books. Try placing them behind a horizontal stack of books. *Pull all of your books to the front! This is one of the first things I notice when I go into a room with bookcases. So if you are planning on having me over don't be offended if you catch me sticking my arm behind your books and pulling them forward. :) No judgement here, just a nervous tick. * I don't always recommend hanging pictures on the front of bookcases but in this particular library I thought it be a good addition. What do you think? Keep it or leave it? *Add organic materials- like wheat or soy beans... just kidding. Are you still reading? But seriously- organic as in plants, flowers, twigs, bowl of fruit, etc. *Try using accessories as book ends. * Don't ignore your bookcases. In most rooms they have SO much potential to make a space look GREAT! * Have fun with it. Put what you love in your bookcases... and if I'm ever in your library feed me strong coffee and bribe me with Christmas presents. One of my favorite boutique stores in Nashville is one called Gilchrist-Gilchrist. I recently went in the store and felt like I walked into a winter wonderland. No joke. But it's always like that- The whimsical cottage feel, beautiful vintage finds, the laid-back vibe, good company, soothing music, ALL result in one charming store. When it comes to decorating your Christmas tree- MORE is better. Set the mood with mercury glass. Genia is a big fan of mercury glass- and how can you argue with her looking at these gorgeous pictures?? Click here for her very helpful tips on buying mercury glass. Tie it together with One Color. Use clear glass to serve as a subtle back drop when displaying Christmas decor. Wreaths of three unify a space. Another one of her style secrets: Stack a few wrapped presents in unconventional spaces to add pops of color in any room! Dress up great finds like this vintage window frame! And mix metallics with fresh evergreens. Embellish what you already have. To read Southern Accent's full article click here. People tend to OVER decorate. Don't mess with a good thing. Our tendency to over decorate always reminds me of a funny story about my niece, Whitman. About a year ago Whitman came home from Mother's Day Out pretty upset. It was festival day and the face painting lady did NOT decorate her face the way she wanted. "Well, what did you want?" her mother asked as sweet Whitman stared up at her with a butterfly and heart on each cheek. "I wanted a snake on my forehead!" Hmmm.. can't imagine why the face-painting-lady refused that one. So her mother kindly drew a green snake across her forehead and called it a day. You would think that the story ends here... Wrong. I repeat: Don't mess with a good thing. And Whitman, when you get older and realize I have put these pictures of you on the internet you might not be pleased with me. If this is the case you have my permission to paint my face however you want. Meet my grandmother: Murray Berry. And that little squirt she's holding? ME. In my life Murray Berry was known as "Damommy" (Yes, it's true. Feel free to comment on this name at the end of the post). Aside from the life lessons Damommy taught me (including: travel, love well, comb your hair before pictures, follow your heart, dinner before dessert (never the opposite! ), no sniveling, and always help people who are less fortunate,.. the list goes on) I feel that she instilled in me a strong sense of "home." You walked into her front door and it wasn't just a roof over your head- you were stepping into her world. Everything that she represented was wrapped up in 4,000 warm & cozy square feet. Home has always been like that for me. And yes, you could definitely say I'm a homebody. I think that's why I love what I do... to help someone else make their home a true reflection of them, somewhere that is a safe haven for their family, a place that provides contentment... Whether it is a client that wants it all with frilly fringe or one who prefers the modern, minimal approach- the second I walk in the front door I enter their world. My grandmother would always say it's not only important to display your books, but it is how you display them as well. The key here is: Don't think about it too hard. Be flexible! If you aren't you will end up with a bookcase that looks programmed and stiff. Put them in all different directions, take off the ugly jackets that aren't working with your scheme (no offense Tom Clancy), put your all time favorite books in a prime location, mix the colors up, grab a stack of larger books and place them somewhere else in the room (see picture above). *And the most important trick!! **: Pull the books to the very front of the bookcase. No shoving them in the back! It makes the biggest difference, I promise. I think the moment I really realized my grandmother (drastically) rubbed off on my 'nesting' style was shortly after I got married. We settled into a cute, old house in Nashville and within days I had every wall covered in artwork... and 3 pieces of furniture to speak of. I joked with my friends: "I'd love for you to come over to our new house- We can all sit on bean bags and look at our pretty walls!" We are fortunate to have artistic friends and family (hence the wedding gift wall decor)- and I still have trouble choosing an ottoman over a beautiful framed b/w photograph. The point is: start collecting! There is nothing better than artwork. 4. Every House Needs.... Good Lighting! *Use pink light bulbs.... it makes everyone (including yourself) look better. *Turn all the lamps on when you are expecting guests. EVEN WHEN IT'S DAYLIGHT. This (is completely unrelated but) goes hand in hand with one of my best friend Katie's advice about how to make your day better: Open your windows. Turn on every light in your room. And make your bed. ... and no, katie is not 4 years old. Damommy would probably say that the most important part of the house is the entry. 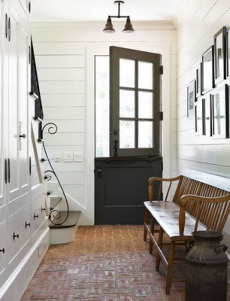 Whether that be your foyer, stair hall, courtyard or front porch- do not neglect this spot. *Hire an acapella group to sit on your front stoop and sing "Bright Side of the Road" to anyone passing by.... Why not? Start Looking, you'll find one. And odds are if you don't find a fake one, you might want to call Cooks Pest Control. Or buy one of your own. Damommy passed away in August of 2003, shortly after my grandfather's death. We think she died of a broken heart. Perhaps that same roof over her head didn't feel like "home" without him in it. Although I think if I mentioned that I had a "blog" she would hand me a tissue and send me to bed.